Can you, or anyone else, check this hymn's lyrics with what is actually being sung? Go to major feasts --> LA Deacons --> Pachoise. Listen to what they sing. Their ending is not "Eko-wab, Eko-Wab, Eko-Wap,... Echoise ennie-eoun, Khristos Anesti Eknekron". They continue without even saying Christ has risen in it. I prefer the lyrics you've written. This is odd, because I think I have a recording of them where they actually follow the lyrics. Thanks for updating the lyrics or asking our friends from LA Diocese to redo this recording. The ending in the recording is the actual correct one known as the praise of the angels. The text you refer to is originally an ending of one of the Asapasmos Adam for the Resurrection Feast. The verse was changed by Muallim Ibrahim Ayad and there is no other mainstream source in existence. You will also note that the Choir of Muallim Mikhail Girgis Al Batanouny on MESat recorded it with its original ending and not followed modern practice. Nothing to do with Muallem Ibrahim. Already doing what was common practice. The Kiahk Pachois also has ekowab so it isn't wrong to have something other than Glory to God... Albeir has his chorus record it both ways and says that they're both acceptable. It was changed officially in the Cathedral liturgies by Muallim Ibrahim and he even spoke to Nahdet El Kanaes and requested that they changed it in the book as they use it in the Clerical college and this did not happen for a long time. I don't see how you can say it was "common practice" when it wasn't. If you look in Albeir's book he writes both but clearly states this is modern practice and this is the original write. Fr Athanasious El Muharraqi states in his research which he submitted to the modern HICS choir that the paralex traditionally always ended with the praise of the angels And that the verse was not just for the Nativity. In regards to the paralex for Kiahk it is not written in either of the main Service books be that Nahdet El Kanaes or Muallim Farag and the oldest recording in existence is HICS which is a solo by Fr Mettias Nasr. 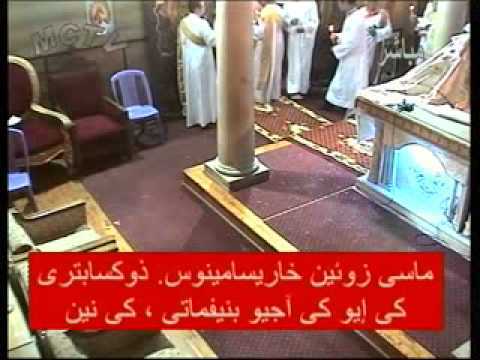 1) M. Faheem and Dr. Youssef Mansour in the Cathedral used to do it before him in the liturgies with Pope Kyrillos. 2) Taking verses from different hymns and applying them elsewhere is common in everything in our ritual services. In regards to point 1 I would love to hear evidence as I have heard Resurrection liturgies of this period with the said Archdeacons and the last verse was never changed. I can also say that if this was truly what Archdeacon Fahim taught it would be a lot more common practice but it wasn't and isn't. Point 2 that you make is a very genreal statement and not proof in itself. 1) In the process of looking through the files i have. Your point, however, isn't necessarily true. Many things that M Faheem taught have not become common practice. A few examples include, theotokia kiahky, fai etafenf during priest funerals, and a bunch more. Again oral tradition and the handing down of the spirit of the hymns isn't something you can just document. 2) It is a general statement but it is proof that these things were never standard. There are tons of hymns and verses that are taken from each other. Praxis responses made from doxologies and vice versa. Aspazmoses taken from both of the latter. It is okay to have different practices from different areas. I fully appreciate the power of oral tradition, however I also know a lot of what Archdeacon Fahim taught via cantors of the Cathedral that learnt from him such as Satir Mikhail and Osama Fawzy. If he taught this then at least he would have practiced this in his own church. I also agree with your point two to an extent but again relating this to the topic of the thread this generalisation in itself does not support the change of the last verse of the Resurrection paralex. I can't believe that its common information that you all seem to know which mo3allim ordered which changes to these hymns. That's just unbelievable. i.e. end it with: Ekhristos Anesti Eknekron. Let's say for now the two endings exist although the HICS choir recorded the normal ending and the letter from Archdeacon Roushdy Wassef administrator of the clerical college states that their recordings are the official source of hymns for the coptic church. In my view for unification of hymns to happen there will need to be a lot of prayer, willing subjectiveness and humbleness that what happens currently may not necessarily be what is right. @drewhalim Glad you mentioned his church to see what they do: Check this video out! Completely different. Also i have a recording of muallem Faheem extending the ending of nictratia as well. In regards to Archdeacon Roushdy, he has no authority to claim what the source of the church is for anything. On top of that all their discussion is about pronunciation not the hymns. HICS is not a standalone source because they have not recorded everything to begin with. Thats along with many other reasons. Any cantor that you speak to now will tell you that HICS is not a complete source, nor was it even always accurate. In regards to Pachois for Kiahk, M Gad records that as well. I know M.Gad has recorded the paralex for Kiahk but he is not the original source. When I spoke to him about 2 months ago and M.Reda as a 3 way conversation they both agreed that since forming the Choir of Muallim Mikhail they have changed a lot of hymns from the way they were originally taught to old sources that they had found and this is evident via the choir recordings. This choir is the modern HICS choir so I'm not just referring to the old recordings of Dr Ragheb Moftah. Archdeacon Roushdy is the head administratior of the clerical college so he has every right to confirm the sources to be used. This is what he is employed to do so nothing go do with any of us. I have just watched the video and while very interesting and different it still does not back up your claim that Archdeacon Fahim changed the last verse. The old Cathedral has always been quite different from other churches in Cairo mainly because while Fahim was alive nothing he said was questioned. I believe this will change in due course as Cantors in Cairo are working hard on unification and Cantor Elia from the Cathedral has now joined the HICS choir since the Resurrection recordings and stands on the left of M.Gad. Drew we need to clarify and point out a few things. 1) Not everything thats recorded is accurate, not everything thats recorded is the only way, not everything that was recorded is exclusive. 2) the hymns can be anywhere from entire churchwide tradition to local church tradition. Different practices are acceptable within theologically correct parameters. The point of me showing the video to you was to highlight that even the church which M. Faheem served in says it completely different than what we say. Since you claimed the cantors of that church are his disciples and you'd like to see the oral tradition, i put that video up. The idea that I'm trying to point out is that these differences are not dramatic and they are acceptable. M. Faheem was one of the most talented cantors of his time and he is a major source in the hymnology of the church. He was eloquent in Greek, was musically talented, played the lute, and studied under and with Cantor Mikhail, Dr. Youssef Mansour, and many other greats in the church. Drew, you are focused on only one school of thought and trying anything you can to say that the other school of thought is wrong. That doesn't make sense to me. This isn't a matter of questioning a person and making sure everyone stays on track. This becomes personal preference. HICS is not completely accurate either. Just because they take from Mikhail and Farag doesn't make them 100 percent accurate. There are mistakes in both of their recordings. The idea is to take the common things from them all. It is to find the best sounding and musically acceptable groups of hazzat and use them. M. Tawfik spoke in several interviews about this. This isn't about being stingy. Its about being logical and viable. Things can be said in more than one way. Things can be changed so long as they continue to make sense. The rites and hymns are there for our benefit not vice versa. In regards to Archdeacon Roushdy: Archdeacon Roushdy does not know all the hymns of the church, is not a cantor, and is not a scholar in the hymns of the church. He was not handed anything down by any old cantors, nor did he study hymnology in the institutes of egypt. Since he is not a professional in the field he shouldn't have any right to claim sources, make decisions, or claim authority over anything. Writing up a paper and signing it doesn't make anything official. As a matter of fact, he signed the paper that the synod committee wrote and he's not even part of that committee. So please do not use him as a source when it comes to anything with hymnology. His sole purpose of the things he's doing is to shut down M. Ibrahim. Its evident and obvious. There is no such a thing as borrowing verses from different hymns. The verses you are talking about are just verses that happen to be set to different tunes, because they have important spiritual and theological significance. We cannot say that "shara na Maria" is borrowed from Acts response, or seventh part of Sunday taodokeya, or vice versa. But the repetition of those verses in different times of the day, month, or year, serves as educating and strengthening some concepts which have to be deeply rooted in Coptic Orthodox Christians (also for saints, etc). However, the practice of tagging on a doxology verse onto for instance the Gospel response, particularly in feasts, is I believe an invention that the cathedral chorus started because of the large number of people who greet the pope during such events. Nothing more, nothing less. Other verses are original and genuine and not "borrowed". And by the way if we want to add a verse for a particular saint as an Acts response, we find their respective verse (or a construct for) in verses of cymbals, because they are both Adam - aspasmos watos in their respective doxology. Musically speaking the Acts response is not really "Adam". Adam refers to both the day and the music. Adam hymns have 5 notes per line while Batos has 8+ notes per line. You will notice that the verses taken from the Adam Theotokia, like Shere ne Maria, require extra hazzats when it is said for the Acts respond (ex, extra hazzat for tichrompi, emevnouti). But traditional "Batos" texts found in Batos doxologies, fit much better in the Acts response, like St Mark's Shere nak o pimartyros. If you tried to use a traditional "Adam" text for St Mark, for example "Shere penwit Markos pievangelistis, pirefgor evol ente niidolon" for the Acts response, you will have to add hazzat to fit the tune to the text. Regarding the Cymbals verses, I think it is meant to be Adam musically but the texts are predominately Batos. Thus there are many Cymbals verses that require us to cram lots of words and syllables into a line. Again, St Mark's verse, Shere nak o pimartyros, comes to mind. We cram/speed up the first line to fit all those words into the the tune (which I think is supposed to be Adam). Regarding Gospel responses, you are right that it is a new convention. But all Gospel responses are musically "Batos". And there was a time when every liturgy had a different response (and multiple verses) for the Gospel responses as we see in "Tartyb al baea" So there is some precedence for multiple verses used in the Gospel response. Please don't misunderstand what I will say, but while I very much respect your deductions, they are not any thing more. Acts response is Adam. To fit the watos verses of the martyrs and St. Mark is wrong, but has become unfortunately common practice. The very same happened with verses of cymbals. It doesn't matter if you can fit more syllables, construct or cram in more hazzat, by definition those two are Adam. Is there ANYTHING wrong if I stick the to the lyrics given in the text on the Media page for this hymn?? Would that be OK?? This is SO annoying that we don't just follow one Hymn book!! eh da! Zoxsasi, say whatever your church deacons say. It's really that simple. I'm the only deacon in my Church!! In my opinion, it is always best to say the lyrics the congregation has access too. If the hymn is not theologically wrong, or just plainly wrong, it's not wrong to say a hymn with outdated lyrics. In the long run, it can be your responsibility to move on to the newly agreed upon lyrics by also making sure the congregation has access to that update. God bless your service. I was listening to the LA Deacons. I love their voices and was practicing Pachoise so I could sing it in Church. I am the Church's Moa3lim, deacon and subdeacon, and aghnostos. I am the everything and nothing at the same time. So I come on Tasbeha.org to look at the lyrics and I find that people are telling me that these are outdated lyrics... Gosh! As if there's an expiry date on these hymns or something. This is all so new to me. I'm not used to this sort of behaviour. If I did not sing Pachoise, I can tell you that the entire liturgy would pass as if it was a normal Sunday. You wouldn't know that you are in the Resurrection/Joyful period. OK - back to business: tell me this: the updated lyrics - does anyone have them?? can you share them with me please? Its fine to say whichever. Say what you are more comfortable with. Thanks DG. I think the lyrics on this website are the easiest. If I go freestyling, I'll mess up. Its best to keep it short and sweet. Having said that, just for the record, can anyone share me the lyrics that the LA Deacons use?? I'd really appreciate that. Well, I still like to sing these hymns outside of the Holy Fifties; therefore, can I still have the updated lyrics.